Today I decided to upgrade my Mythdora to the latest verison, 5.0. I downloaded the CD media and booted into the install. I had to do a text install to be able to watch it on my TV. Then I just needed to yum install the kmod-nvidia drivers. (Although, first I had to uninstall the previous nvidia drivers – they were neither automatically upgraded nor uninstalled) I started at about 1930 and was able to be completely up and running by 2055, just in time so that I didn’t have to missmy 2100 recording of “Best Week Ever”. The only major issue was that my current theme didn’t work, it was missing all of the words. But by using the keyboard and scrolling down and remembering where setup was, I was able to get to the setup menu and change the theme and then it works. I think it was just a problem of the prevoius theme being cached and there have been some changes to the included themes. One of the most noticable changes to the themes is that (where the author has coded it in), a date and time stamp are now supported. So from your “Home” menu you can see what time it is – pretty convenient. The weather forecast now works – it was broken in 0.20. 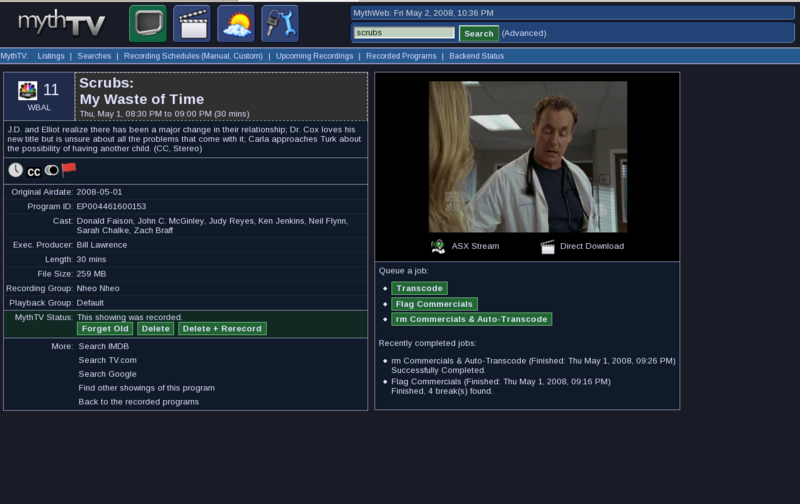 They’ve also added in a new “Movie Times” plugin which tells you when movies in your zip code are playing. The system status page now gives better, and more relevant information. Under the Mythdora Tools they’ve added “Mythdora Cron Jobs” to help out with certain tasks you might want to set cron to automatically run for you. One great new feature is the ability to mark recordings as having been watched. I was able to do this manually and I hope it also does so automatically. Sometimes we’re left wondering if we’ve seen an episode before (especially if we didn’t delete it) so this would be especially helpful. Another feature I’m looking forward to learning how to use is the Watch List that lets you know in which order to watch episodes. Overall I was VERY happy with the great job the Mythdora team did on this release. The upgrade went very smoothly and the new features are working very well. Pingback: Boycott Novell » Links 06/05/2008: OpenSolaris 2008.5 Reviewed; Microsoft Lost $24,000,000,000 in Market Value Since Yahoo! Bid!